During cancer treatment, you may need to boost your intake of protein and calories in order to prevent weight loss and muscle wasting. However, radiation or chemotherapy can cause nausea and diarrhea and make swallowing or chewing painful. High-calorie, high-protein drinks — either commercially made or prepared at home — may help you maintain your weight and lean tissue mass. When you're undergoing cancer treatment, you may find it easier to tolerate small servings of nutrient-rich beverages than large portions of solid foods. Energy-dense meal replacements combine a high number of calories and high protein with a low liquid volume. Look for instant breakfast drinks, liquid meal replacements or clear nutrition supplements that are formulated to promote weight gain. A milkshake made with a packet of instant breakfast mix, whole milk and ice cream has 474 calories and 20 g of protein per serving. Radiation treatments to the head and neck can cause mouth pain, throat pain and swallowing or chewing difficulties. Cool smoothies made with sherbet, ice cream, yogurt or frozen fruit may soothe a sore throat while providing extra calories, protein, vitamins and minerals. If you're having trouble digesting dairy products due to lactose intolerance related to antibiotics or radiation, try yogurt or ice cream made with soy, rice, almond or coconut milk. 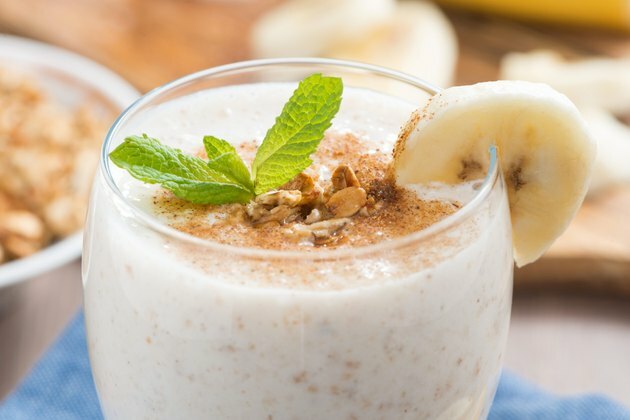 To increase the protein and calories in your smoothies, blend extra egg whites, powdered milk, avocados, wheat germ, peanut butter or cashew nuts with your liquid ingredients. A smoothie made with regular yogurt, whole milk and instant breakfast mix has 400 calories and 19 g of protein per serving. You can supplement your diet with ready-made protein shakes or purchase protein powders to blend into the shakes you prepare at home. Supplements made from soy beans, rice, egg whites or whey -- a milk-based protein -- are the most common protein powders available. In addition to augmenting the calorie content of your drinks, supplemental protein boosts your natural immunity and gives your body the materials it needs to rebuild tissues during cancer treatment. One tbsp. of a milk-based protein powder provides 45 calories and 5 g of protein. To prepare a beverage or cooking ingredient that gives you additional protein, calories and calcium, add 1 cup of powdered nonfat dried milk to 1 qt. of whole or low-fat milk. Blend the mixture well and chill for at least six hours. One cup of fortified milk has 211 calories and 14 g of protein.